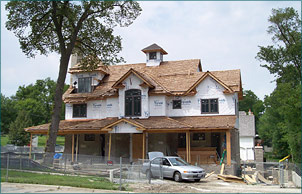 Providing the highest quality carpentry throughout Chicago and its surrounding suburbs. Sabala offers expert skills in rough carpentry for custom-built wood frame houses from mid-size to large to spectacular. We accept the most challenging projects and deliver unique solutions to meet every homebuilder’s exact specifications. In addition, we also offer comrehensive finish carpentry services. We are committed to delivering only the finest craftsmanship while maintaining safety, integrity, and efficient performance. It is our desire to deliver an exceptional product that will be completed according to your schedule, exceed your expectations for quality and be accomplished within your budget. Most of our projects are referrals from our hundreds of satisfied customers. We would be delighted to put you in touch with one of them if you’d like to hear a personal testimonial.